Click for a bigger picture. Note that many of these are yogurt and fruit combos, though all of them have so much sugar in them that they can hardly be considered healthy for such inclusions. Displays of gelatin (what is called "jelly") in Japan are being beefed up because of the hotter than hell summer and weaker than a new-born kitten air conditioning. At first, I thought this might be all about fooling people into thinking tossing one of these tubs in the refrigerator and gulping down a slithery bit of gelatin coolness would make them forget that they'd sweated an embarrassing huge web spot on their shirts, but I'm starting to believe otherwise. The shops themselves aren't exactly showering us with cool relief which means that their chocolate stores have a good chance of melting in 82 degree F./28 degree C. settings. 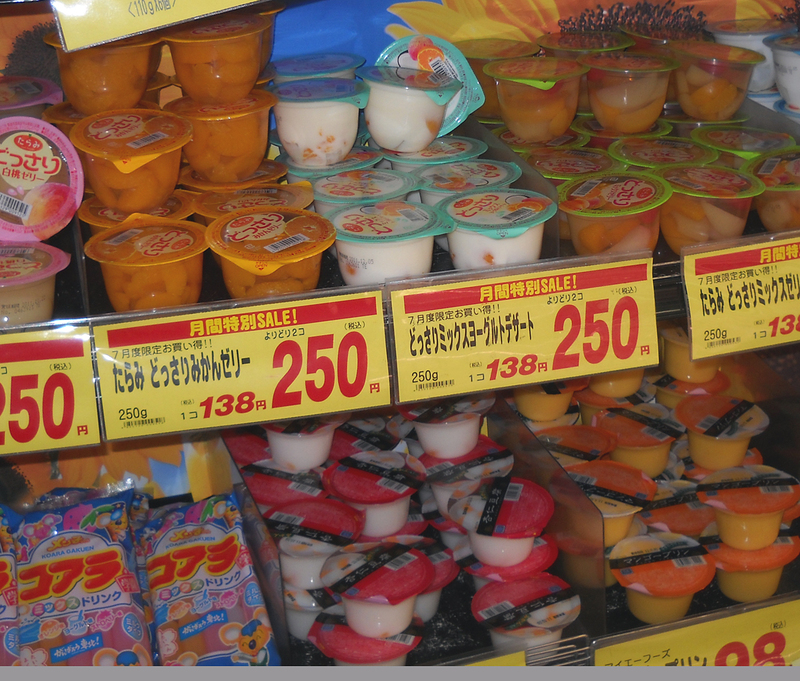 It's far safer to stock jellies than to stock other sorts of sweets in the summer. This is a chocolate party that I am more than fashionably late in attending. In fact, I'd say I'm showing up just about as the hostess is clearing away the dishes and shooing out the final round of guests. The fact that I waited so long to pick up a bar of this chocolate is a reflection of how many other things were more interesting than this rather than a lack of desire to try it. 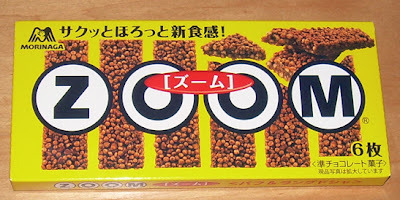 The fact of the matter is that fruit-flavored chocolate is very common in Japan and if I sampled every one of them, I'd have time to write about little else. All of that being said, mango isn't the most common of such pairings, though mango is currently the fruit-flavored darling of Japan. Dried mango was talked about for its health benefits a year or two ago (I can't keep track of when these food fads start, I've got blog posts to write!) and since then you see mango everywhere and in everything. One thing I can definitely say about Japan is that where the media leads, the people follow with a vengeance. Someone once said eating bananas in the morning would help you lose weight and there wasn't a banana to be found for awhile. I still know women who eat a banana every morning for breakfast based on this (mistaken) notion. Getting back to mango, and this chocolate in particular. 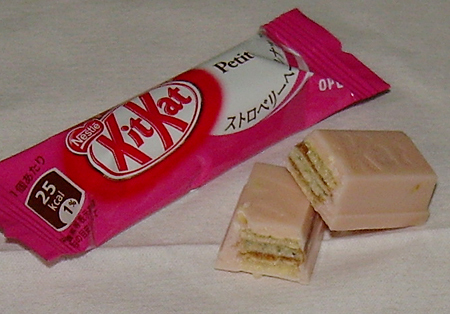 It is a thin layer of mango-flavored chocolate in the center sandwiched between two milk chocolate layers. 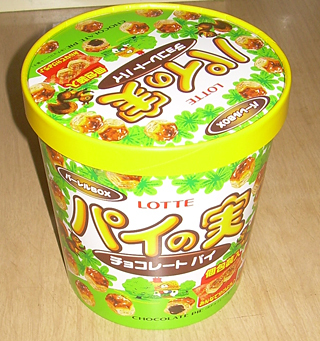 The mango flavor is very strong and on the sweeter side. 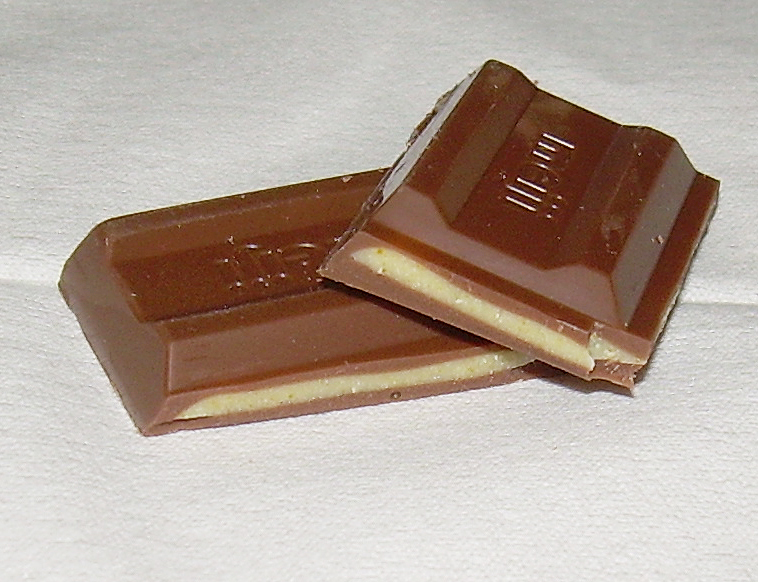 The chocolate is fairly overpowered and doesn't really have a strong effect on the overall taste. I wonder if its main effect is to mitigate some of the cloying nature of white chocolate based fruit flavoring rather than to mix and pair with the mango. All of that in no way says this is bad. It's actually pretty tasty. I think it could have been a little better had the chocolate played a bigger role (or have been a bit darker), but it's still good. I wouldn't say I'm over the moon about it, but I am enjoying slowly eating the bar one or two squares at a time. This is definitely not the sort of thing you're going to wolf down all at one go though. If you're a mango fan, this is worth a try, but perhaps not something worth tracking down at all costs. In Japan, you can score a bucket of pies... teeny, tiny pies, but a bucket nonetheless! Sometimes I think about the future of this blog post-leaving Japan. There is no doubt that I will be able to procure Japanese snacks one way or another after I leave, but I wonder if the same interest value will be there for me. Part of the delight of sampling and talking about such trivial things is that the way in which I get them, though frequently similar, is part of life here. Getting them by mail order doesn't carry nearly a much oomph as finding them on sale for half their price at a discount shop, or whining about how I had to tramp all over my neighborhood to find that one place that carried something I wanted. The notion of a bucket of pies is somewhat spoiled when you open it and find this bag crammed inside. In the case of this, my story is quite unique. My husband and I have taken to walking later in the evening because of the sun beating down on us during the hot and difficult daylight hours. We went out for a rare 9:00 pm stroll and found ourselves at a Namco gaming center. For kicks, he decided to try a machine which had tubs of both these pies and Koala's March cookies. He wanted to see if he could knock one over because they looked to be balanced such that it should have been fairly simple. This is part of the deceptive nature of such machines, but his first attempt (he put in 500 yen ($6.33) which gets you 6 tries), he did a good job knocking one of the Koala's March tubs off-based. On the second try, he hooked the pie tub and it fell quite by accident. Unfortunately, the position of the Koala's March tub became disadvantageous after this and he couldn't get another. And keeping with the theme of packaging inside of packaging inside of more packaging, we find two-packs of tiny pie bits. 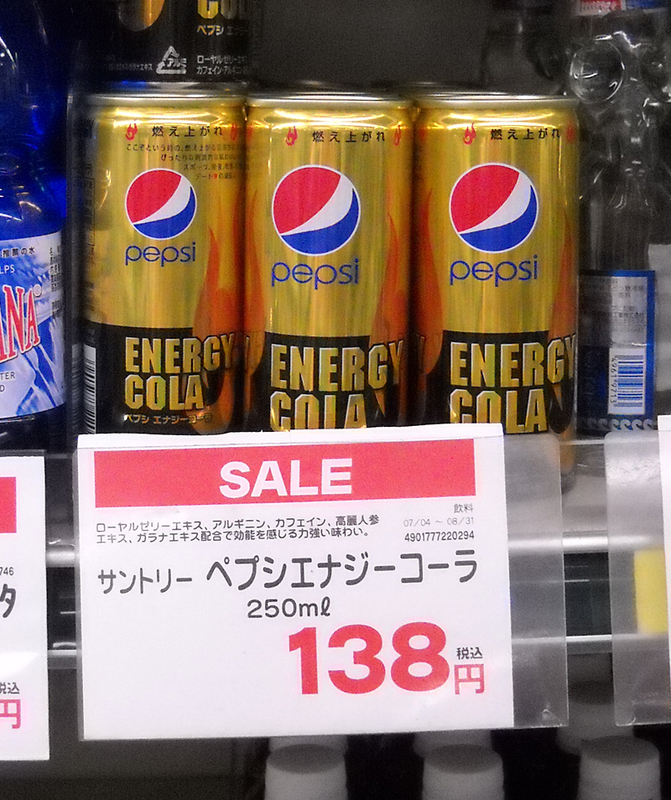 So, we "paid" 500 yen for these, which probably isn't too far from the value of this quantity (I discovered a bag of these costs about 263 yen, so, that is the true value), though I don't think you can buy this configuration in markets. For the record, you can get 12-packs of these from Amazon for about $4. This has a bag with 64 pieces in it in 32 two-packs. Each pie is slightly smaller than a 100 yen coin or American quarter and has 24 calories. I think the name of this, incidentally, translates to "pie nuts", though the Chinese character also means "real" so it may be a play on words. I think the nuggets are supposed to suggest nuts (and that's why there are squirrels pictured on the bag). They smell very weakly of chocolate and not much else. The outside of the pie has a little shellac of sugar on the top which lends a little boost to the overall sweetness level, but mostly this is about the texture. The pice is flaky, crispy and crumbles apart in delicate layers. Lotte says there are 64 layers in each one, which is a lot for such a little nibble. The chocolate filling is not particularly intense or sweet, but adds a tasty nuance of chocolate. There is also the flavor of flour steeped in fats that one would expect. It's not especially flavorful, but on the whole, it works. I liked these far more than I expected because I'm not big into "pie" based sweets in general. However, the size, crispiness, and subtle balance of flavors made for a very enjoyable bite or two. I don't know that I'd want another really big bag of these, but I'd certainly pick up a smaller box of one at the store on occasion. 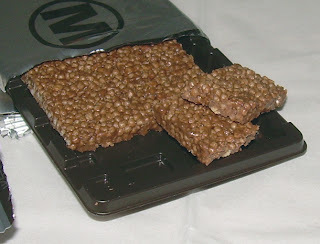 However, I would caution that you have to value texture over strong taste if you're going to like these. 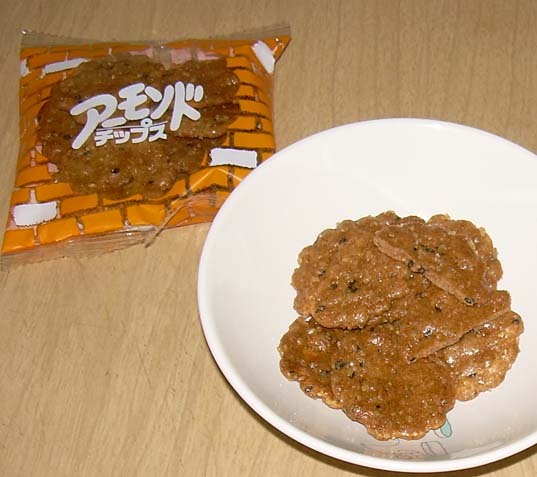 As no one may have noted, I haven't been reviewing as much sembei (rice crackers) as I once did. It turns out that once you run the gamut of most of the common flavors, they tend to come out in reruns or reissues. That doesn't mean I still don't like them or eat them, but just that I don't find review-worthy fodder as often as I once did. Since these reviews get fewer comments than nearly any other type, I don't imagine there are armies of sembei afficionados out there weeping into their empty chip bowl at the dearth of rice cracker reviews. 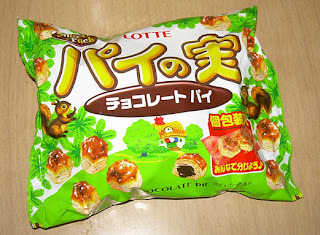 When I chanced upon these, I got that old spark of excitement about trying something new. OK, I'll be honest, it's a pretty small spark as I get less juiced about sembei than say chocolates or baked goods, but this does carry two flavors which I adore: almond and black sesame. Let's face it, there are only so many fires that can burn within one at the idea of a cracker... unless she has the soul of a parrot... but let's not even go there. Doing this review had me looking back over my experiences with Sanko Seika's offerings and it's a mixed bag. They make my absolute favorite sembei of all time, but a lot of their other options left me shrugging my shoulders. A lot of what I've had from them is interesting concepts and flavors that somehow didn't work out for my taste buds in the end for various reasons and received indifferent ratings. 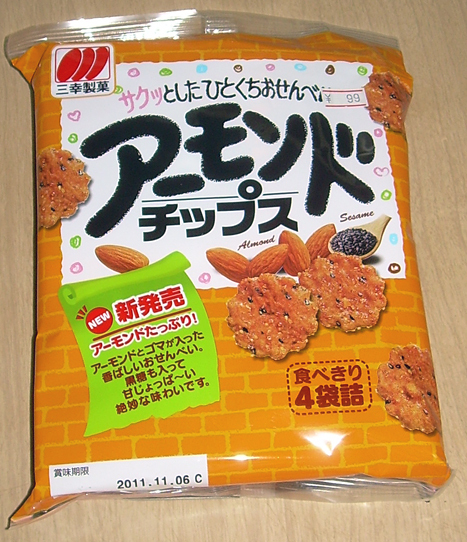 Though the name is "almond chips", the black sesame is the shining star and dominates the cracker's flavor profile. There are 4 single-serving packets in the bag and each is 88 calories and contains 8 crackers of about 4 cm. 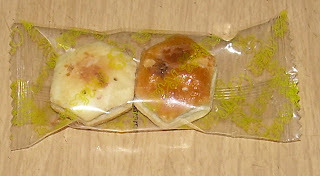 (1.6 in.) in diameter. 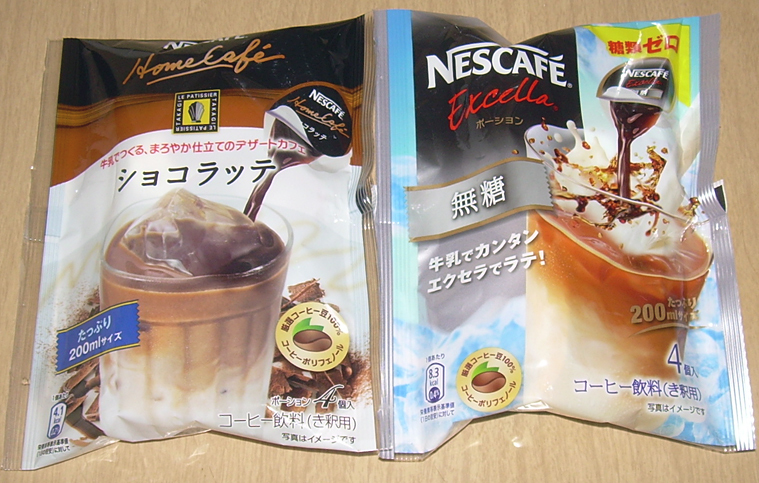 I paid about 150 yen ($1.90) for these at Seiyu supermarket. They are shiny and super crispy with a very satisfying texture. That varnished look is a clue to something about the taste though. These are very sweet and include dextrin, stevia and cocoa powder. I didn't expect them to be so sweet and was really hoping for something closer to a salty or savory sweet. These aren't bad in any way. I liked them, but I wouldn't buy them again. If they cut the sweetness factor by about 50% and let more of the almond shine through in taste (I didn't taste it at all), I think these might be a repeat buy. As it is, I would only recommend them to someone who likes chips that are sweet without a sugary overtone. It turns out that this falls into the same pile as many of my other reviews of Sanka Seika's sembei. I give them an "A" for effort, and won't avoid their products in the future, but I'll keep my expectations appropriately low. Click to see a bigger picture. One of the interesting things about being given lots of food gifts in Japan is that the choices made often reflect the tastes and preferences of the person giving you the gift and allow you to sample things you'd never buy for yourself. A few weeks ago, one of my very kind students gave me a big bag of bread products that she bought at a local bakery called Edy's. I have bought things there on occasion, but I tend to favor Good Morning bakery and another place called Saint Germaine (both are chains). Ostensibly, she bought this for me as a "thank you" for being kind enough to give her a cup of tea during each lesson. 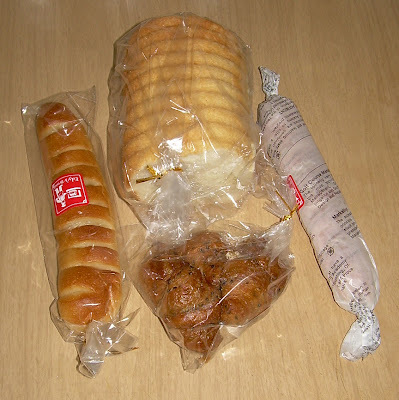 Yes, I've given her 8 or so cups of tea and she's given me a huge bag of bread, a package of pies, a package of chocolates, and a bowl of a Japanese rice dish that she personally made. That sounds like a fair trade. Seriously, she's just generous and sweet, but that is what her stated reason was. The assortment she gave me is pictured above. 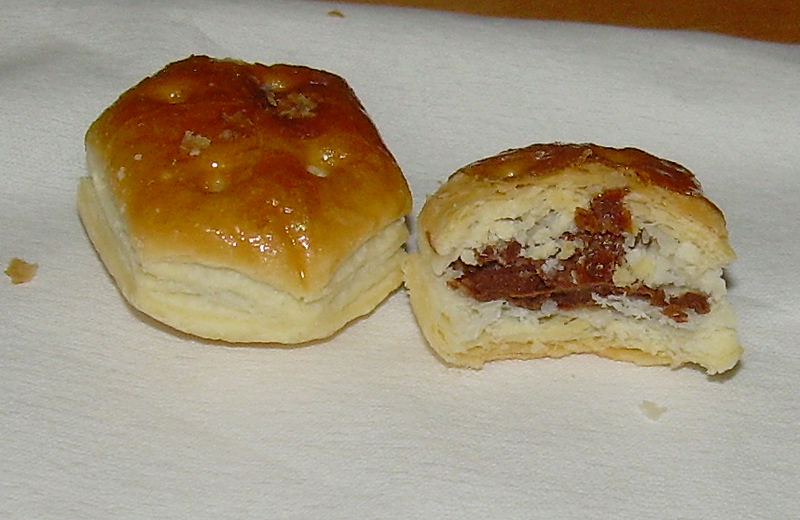 From left and clockwise is a roll stuffed with raisins and whipped margarine, sandwich bread, a paper-wrapped roll (much like the raisin one) stuffed with sweet whipped margarine and sesame croissants. All of these were delightful and I can truthfully say I'd never have chosen these of my own accord. 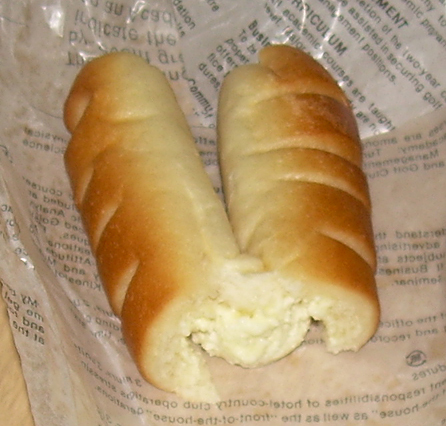 In particular, the paper-wrapped bread was decadent and delicious in a way I never would have expected from something full of nothing more than what looks like whipped butter. The lesson here is to try new things outside of your usual tastes, or at least to have really nice ladies who give you stuff all of the time in your life. I missed whatever hype, if any, surrounded the release of this latest Pepsi release. It jumped out and surprised my husband and I at 7-11 during an evening walk. I wasn't going to try it, but my husband said he'd try it along with me so we handed out our 138 yen ($1.75) for a mere 250 ml. 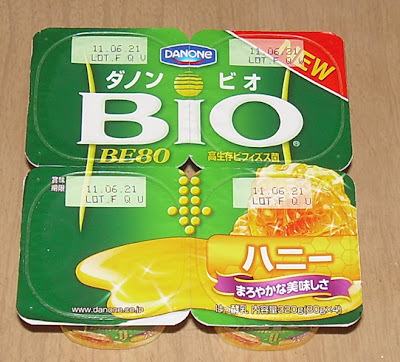 This contains royal jelly extract, caffeine, and arginine as the powering up components. This is not sold in the regular soft drinks section, at least not in most of the convenience stores that I went to. There are special areas with "pep" drinks full of vitamins or caffeine (or both) and that's where we discovered this. 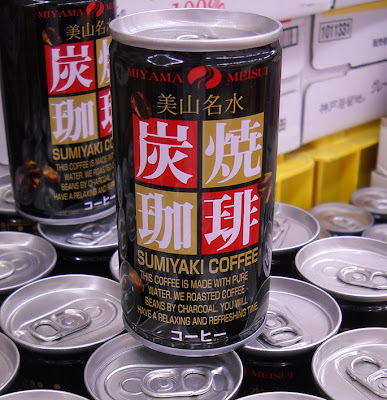 Though Japanese supposedly avoid drugs of all types, heavy use of caffeine, particularly by men, is not uncommon and such drinks are on offer nearly everywhere. In fact, every week when the recyclable trash goes out, one of our neighbors places about a dozen little brown bottles of consumed energy drinks in the bin for glass. I didn't take a picture of the drink when it was poured because it looks pretty much like a normal cola drink. The thing which I can't convey in pictures but was an overwhelming difference was the smell. It has an intense and almost overpowering fruity scent which reminded my husband of some candy back home (though he couldn't remember what kind). After taking a sip, I figured out the source of that smell. It's bubble gum. This Pepsi tastes like bubble gum mixed with cola. It is vile and not pleasant at all to my taste buds. 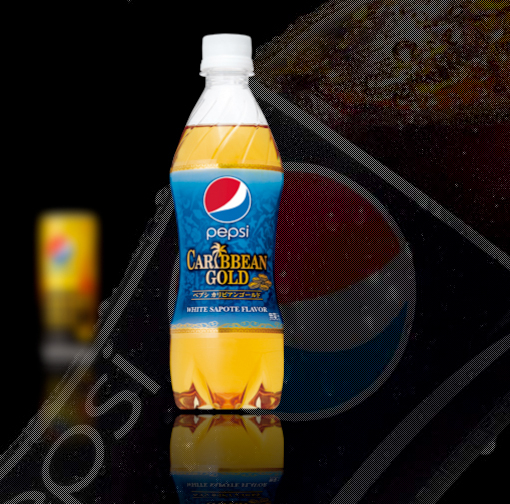 Image screen captured from Pepsi Japan's web site. As an aside, the next true weird iteration of Pepsi will be released next week on July 26. It's Caribbean Gold Pepsi which is supposed to be "white sapote" flavor, which is supposed to be like a banana with hints of bitterness. I'll obviously be giving it a review when I find one. I'm a sucker for any box that has cow illustrations on it. I'm not sure why that is, but it remains the truth and I'm not afraid to admit it! One experience I often have with my students is that I will ask them a question about Japan or Japanese culture and they will answer with, "I never thought about it". When you grow up in a culture, you rarely pause to question why you or other people do the things you do. You simply do it. My point is that you don't think about things very deeply after you've seen them for awhile (or forever), and only today did I ponder this sort of packaging and sales of cheese in Japan. The Japanese, in my experience, are not a nation of cheese eaters. 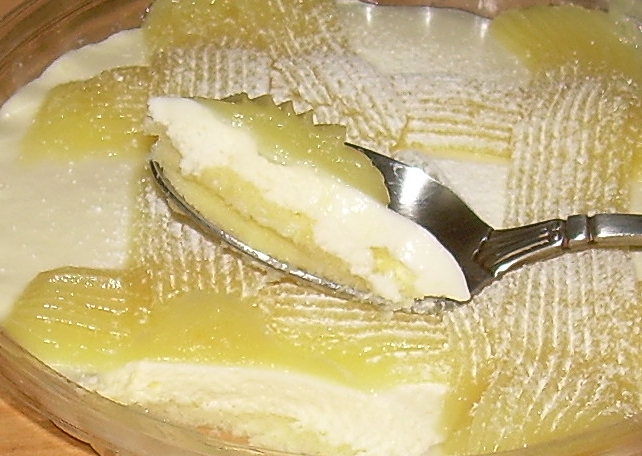 That is not to say they don't eat cheese as a component of a dish. They certainly do. However, I've never spoken to anyone who said they routinely grab a wedge or slice of cheese and chow down on it for a snack. I, on the other hand, often enjoy a slice of cheese and a handful of mini pretzels as a fortifying tea time repast. 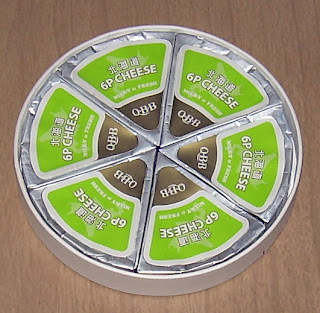 Recently, there has been an increase in the number of varieties of cheese sold in these round boxes with individually wrapped foil wedges. The varieties cover sweet and savory with "rum raisin" and "vanilla" dessert cheese options and faux mozzarella and black pepper varieties as well. Since the retail price of a box of these types of things is around 300 yen ($3.74) for six 18-gram (.63 oz.) wedges, I tend not to buy them because I've got real cheese (rather than processed, as most Japanese cheese is) on hand that costs less. 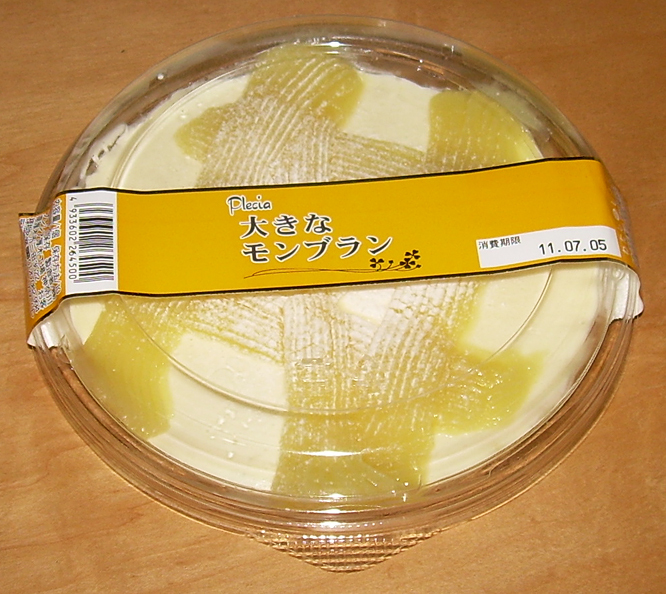 However, with the closest Costco having been shut down due to some earthquake-related fatalities, I ran out of cheese and found this box of Hokkaido cheese for a mere 198 yen ($2.47) at Lawson 100 and decided that I was going to have to get my cheese on more expensively. The main selling point of this is that at least 60% of the milk used for it is from Hokkaido. I've mentioned before that the Japanese are bonkers about regional food, and the fact that origins are mentioned early and often supports this assertion. Yes, in America, people will buy "real Wisconsin cheddar", but I think that that type of selling point isn't nearly as common or as valued. I've never had a discussion with an American who said, "it's from (region), so it's better." I hear such statements at least twice a month living here. 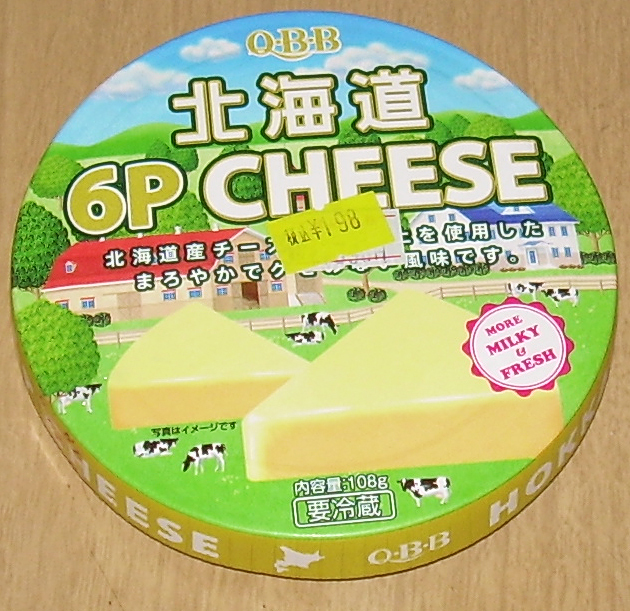 Frankly, I don't know if the dairy being from Hokkaido makes this better cheese, but I do find it an interesting cultural point. For processed cheese, this is pretty nice. It cleaves in a manner which I find satisfying. You can see grains along the break and it has the heft of a real cheese, though it still is softer than the real deal. 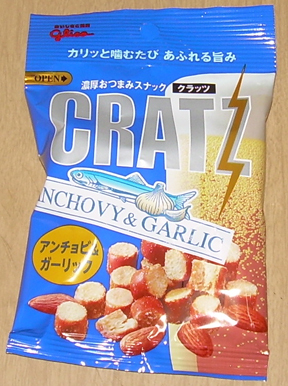 It is mild, but still has a pungency to it so that it tastes like cheese rather than cheese product. 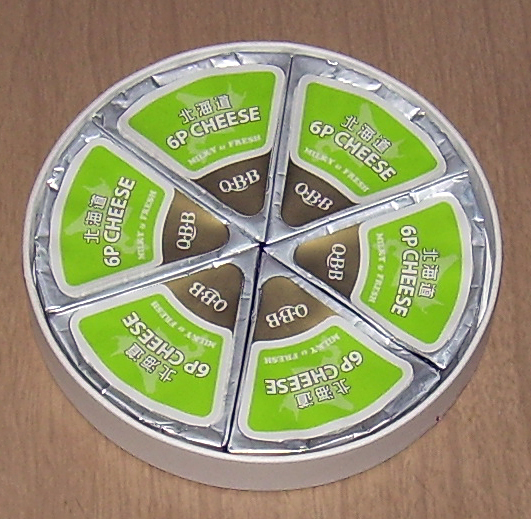 One thing I have to give Japanese processed cheese makers credit for is that, most of the time, they aren't selling blocks of quivery, rubbery Velveeta-style stuff. It is more like a hybrid between real cheese and cream cheese. Each wedge of this is 59 calories and it makes for a nice portion-controlled snack, though it is still more expensive than better quality Costco imported real cheese. 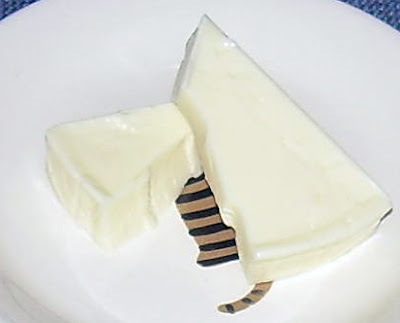 If you don't have that option though, this is a pretty nice choice, and I bet it'd go really well if you sliced it in half and melted it on a cracker (a Triscuit would be divine, but then we're talking about another imported item) with some olive and tomato. It'd also be good with a dab of yuzu-koshoo or wasabi sauce. I can say that I'd definitely buy this again because I had bought it twice before writing this review. No, I'm not over the moon about it, but it was good. And, as for the market I think it is aimed at, I think this falls into the category of otsumami (snacks to be consumed with alcohol) or bento fodder with a heavier emphasis on the former. However, unless I get to have a chat with the marketing folks at QBB, I'll never know for sure. This picture was taken during cherry blossom viewing season at Ueno Park. It illustrates something about eating in public in Tokyo and that's that the birds are bold and opportunistic when they encounter someone snacking in public. Pigeons are the usual moochers, but there are often signs telling people not to feed them. Fortunately for this big, black crow, no such prohibition is made on them. 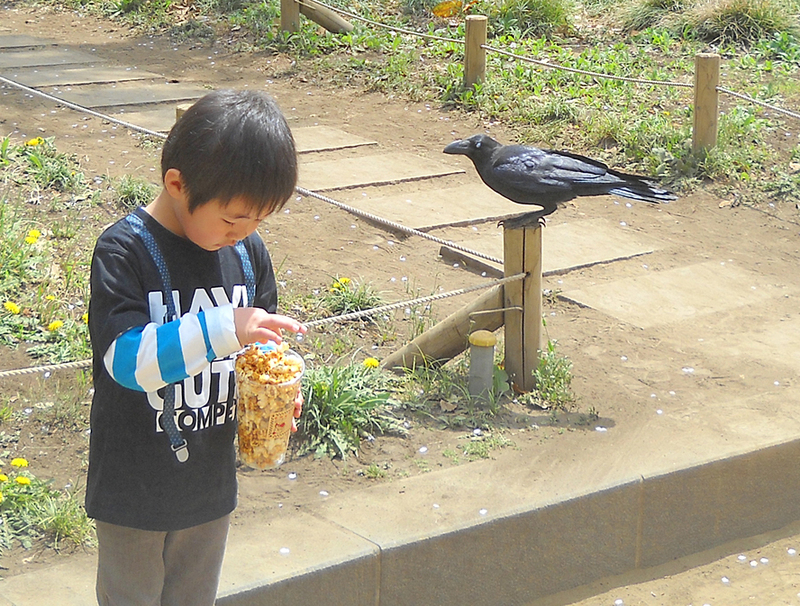 Shortly after this picture was taken, the little boy shared his caramel corn with the crow... or dropped some of it to distract that big beak while he made a getaway. 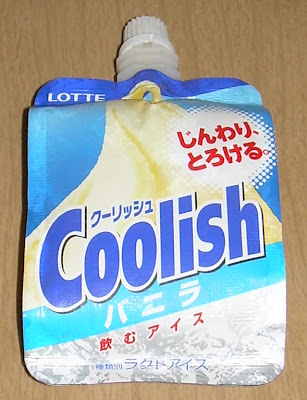 If the astronauts could eat something akin to "real" ice cream, they'd be eating "Coolish". The concept is ice milk that you squeeze up and eat out of a tube, because we like our ice cream eating experiences to resemble things like dispensing toothpaste or hemorrhoid cream. 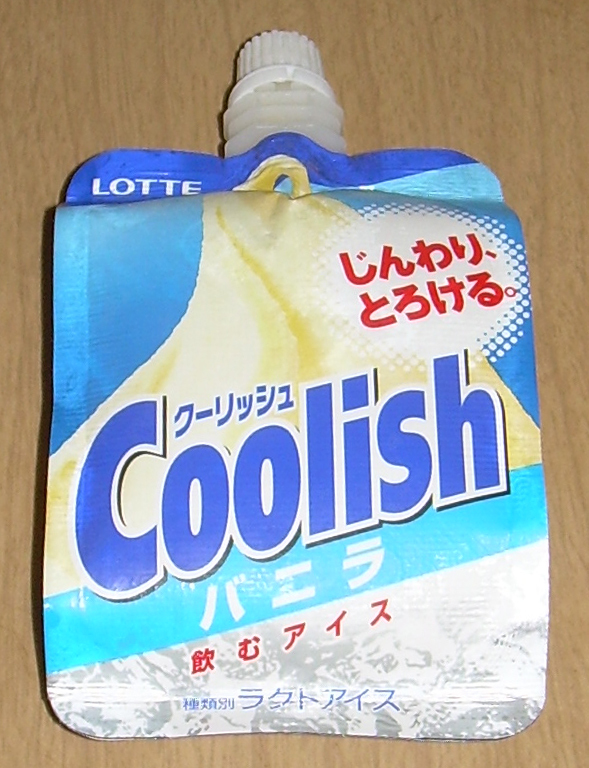 The package is a plastic-coated foil packet which houses some ice milk. You can't eat it immediately out of the freezer, but rather have to let it sit for awhile or warm it with your hands. It won't come out through the tube at the top unless it has thawed a bit. The ice milk itself has little bits of ice crystals in it and has a texture which is more akin to kakigori with cream or ice cream on it than pure ice milk or ice cream. Kakigori is Japanese shaved ice, which is quite popular in summer and is sold in various presentations. The ice crystals add a unique textural dimension, and I liked it, but some may find it distracting. Yes, that's a very attractive delivery system. 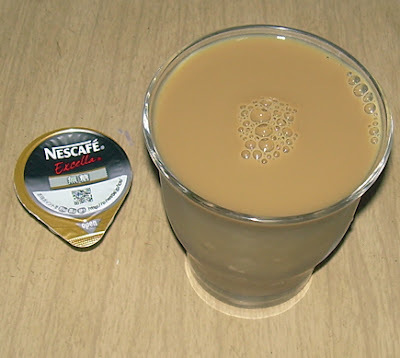 The taste is of strong vanilla and it's quite sweet. It's actually quite delicious, though I doubt that it is coming from real vanilla beans. It's also only 152 calories, which is on the lower side for ice milk. I'm guessing this has to do with the way it is cut with ice crystals. 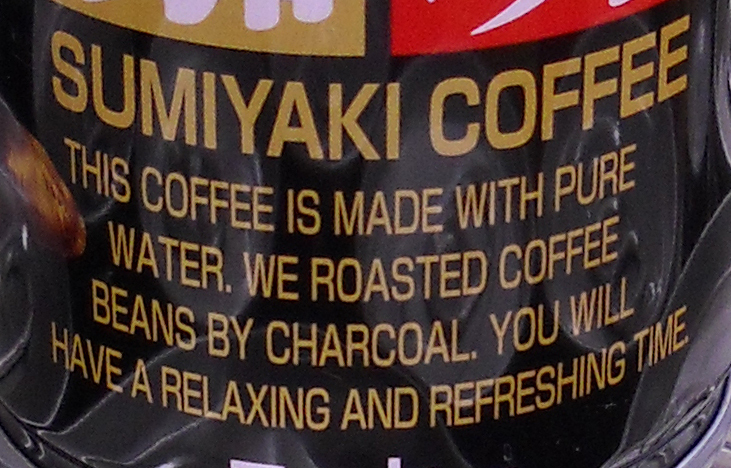 This is a low-end product and sells for 100 yen (about $1.24) for a 140-ml. portion (around a 3/4 cup serving). Real ice cream in Japan tends to cost 3 times as much. 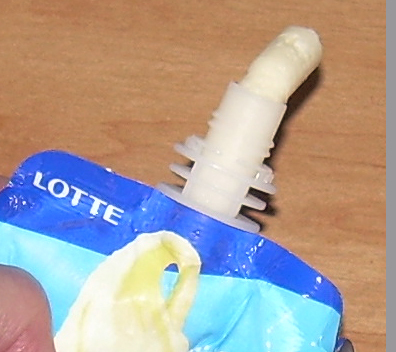 The only problem that I had with this was that it gets softer and softer at the end and unless you're sure to have the tube right in your mouth every moment you're squeezing the packet, it'll surprise you and squirt out on your shirt or pants. Well, that's what it did to me. Also, frankly, suckling on the tube feels a bit weird. I think this is supposed to be similar to a lot of sports drinks in Japan in terms of the experience of consuming it. If you're walking around on a hot day (something that happens a lot right now), this is probably a convenient way to enjoy a very cold snack, but it still makes me feel like I'm still on the bottle. That being said, I'd buy this again as long as I could consume it at home. Blogger changed the way it does scheduling and it seems to have bumped my posting ahead a day. Even though I chose Monday-Friday as my schedule, it looks like it is following a Sunday-Thursday one. My guess is that this is because it is following the time-line for Japan now (whereas it used to follow Pacific Standard Time). That means this week is shifted about 14 hours ahead by American standards. I don't know if this will change or if this is the way it's going to be from now on. At any rate, the days on the posts may appear different, but it'll still be the same 5 days of posting. Thanks to everyone who took part in the contest. I was very, very pleased to have 114 responses and appreciated all of the kind and encouraging words that were offered along with them. This was my most successful contest to date in terms of the total number of participants (I had hoped to get around 100, but my expectations were exceeded nicely). 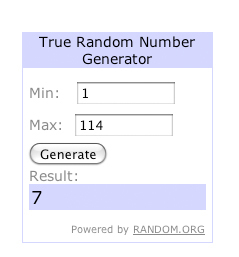 Yes, "Lucky 7"... it's funny how it worked out that way. The 7th comment was by "traveling tech". Please e-mail me at orchidsixtyfour@gmail.com with your mailing address and I'll send the prize package off to you. Thanks again to everyone who took part! And, thank you for following my blog/blogs. I learned that I owe Marvo at "The Impulsive Buy" a drink for all the readers he has sent my way and that my own blogs feed each other pretty well (since so many folks found this through my 1000 Things About Japan blog). I hope to run another contest in the winter, when I can perhaps send something chocolate off without it melting into a puddle of goo! When I was a kid, I hated honey. My mother used to love to slather it on bread or toast, but I was so fussy about texture that I hated the way it tended to sink into the bread and make it mushy inside and leave it kind of crusty on the top. Since I was a kid, I didn't realize this problem could be easily solved by slathering the delicious evil of butter on the bread first. I'm sure my mother didn't mind my staying out of the honey though. It meant all the more for her. I'm also not a fan of the sometimes strong sweetness associated with honey when it is applied too liberally, so I tend to avoid it in general. 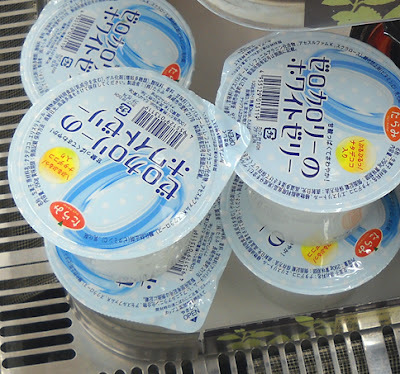 In Japan, however, one can always assume anything which is expensive will be applied with a light touch, and I imagined this yogurt wasn't going to be cloying. Incidentally, in Japan there are two types of "honey" on offer. These is the real stuff which is outrageously expensive for tiny amounts and there is "honey syrup", which is big bottles of the stuff for a reasonable price but is actually honey mixed with other types of sugar syrup. If you're shopping and want it for health benefits, it's best to avoid the latter. Danone is the name of a French company which sells healthy foods and operates in Japan in conjunction with Kirin (best known for its beer). The brand in Japan is focused pretty much on yogurt packaged in very small containers. Four 80-gram (2.8 oz.) 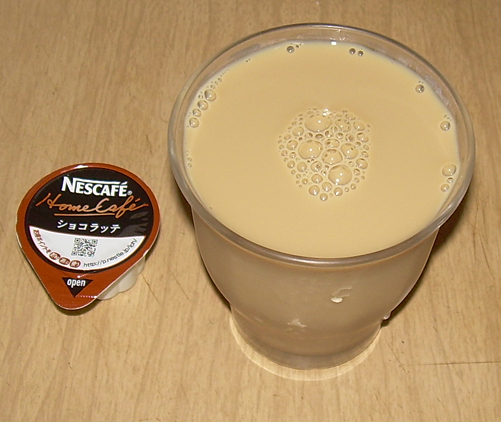 cups cost 218 yen ($2.72) at Seiyu supermarket so it doesn't come cheap. The "Bio" line includes live yogurt cultures to improve digestion. I picked this up partially out of curiosity about the taste, but also because I now pack a lunch twice a week for part-time work and this seemed like a good addition. 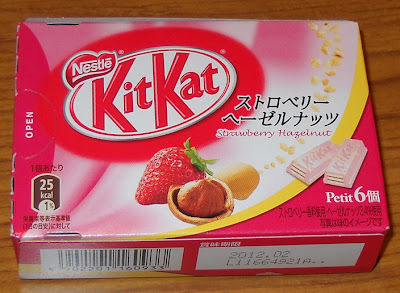 The portion size allows for about 4 spoonfuls of something sweet and nutritious at the end of lunch and at only 71 calories per serving, it's no worse on the hips than a mini KitKat (and a whole lot better for me). There is no visible indication that honey is mixed in, but the flavor is definitely there. 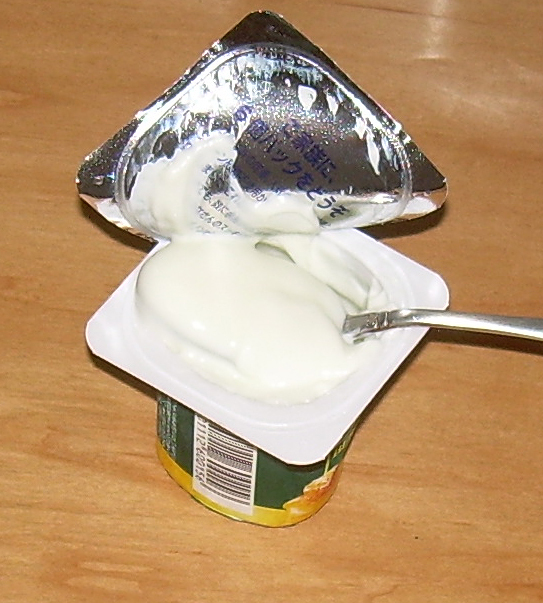 It's just strong enough not to be lost in the slightly sour yogurt without being overbearing. 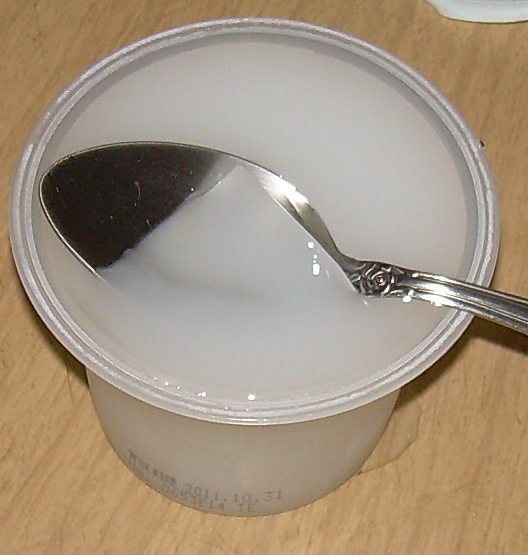 The place where the yogurt really shines though is the silky, rich texture. This was incredibly smooth and creamy. I have a feeling that, when I go back to the U.S., nothing short of high quality Greek yogurt is going to live up to the incredible texture I sometimes experience in consumer-level Japanese yogurt. Yes, the portions are small, but they really make you want to savor every bite. I really enjoyed this, and was sorry to consume the last one. That being said, my very positive experience with this makes me more inclined to sample the other flavor varieties that are out there. If you enjoy a bit of honey with your yogurt, this is a definite "don't miss". The contest winner will be announced this weekend. Thanks to all who took part! My husband and I dropped by a market designed to sell products in bulk to restaurants and people with big freezers and little cash to pick up a jumbo pack of their smoked chicken. We don't have a big freezer, but we do have fairly little cash. 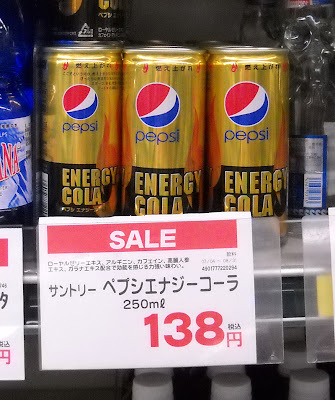 The market also sells a lot of "off brand" items at discount prices (39 yen for some generic cola when cans of Coke retail for 120 yen). The canned coffee pictured above caught my husband's eye because of the message printed on it. I'm sure it is meant as a gentle promise, but to me it comes across as a command. The impulse to look obediently at the can and say, "yes, master," was hard to resist.